Whenever I’m craving pasta, which is fairly often (I mean, I’m Italian, who am I kidding? ), I opt for my handy dandy spiralizer! I use a Veggie Bullet to spiralize all kinds of different vegetables. But there are many other spiralizers out there that work just as well! Today, I present you with this rich and delicious, hearty vegetable bolognese! This amazing meatless bolognese tops a bed of spiralized zucchini noodles for the perfect balance. Yum, yum! I’m often subbing spiralized zucchini or sweet potato noodles for wheat pasta. Vegetable noodle substitutes are low in calories and carbs vs wheat noodles. They’re an easy and delicious choice for weight loss or management. Plus they’re completely wholesome and offer a ton of nutrients when compared to wheat pasta. Additionally, veggie noodles are naturally gluten free, making them perfectly suitable for people with gluten intolerances. 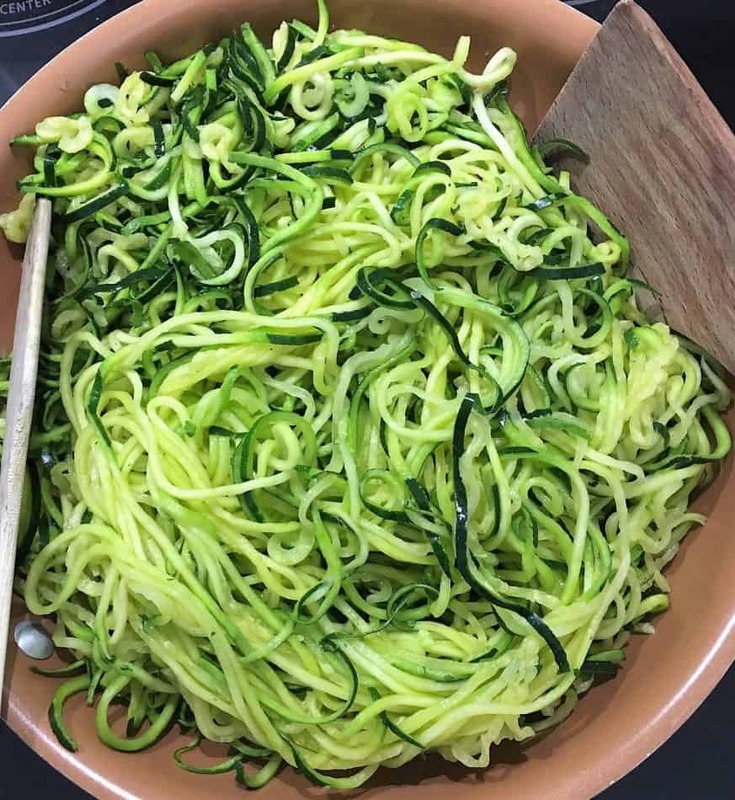 Once you’ve spiralized your zucchini noodles, let the water drain by placing them in a colander. Then place the colander in a large bowl or your kitchen sink. Generously sprinkle the noodles with salt. This will get the water to drain from your noodles and leave you with perfectly textured zucchini noodles once cooked. I typically do this in the morning and let them sit and drain most of the day. If you’re not working ahead, let them sit at least 30 minutes to get most of the water drained. While your noodles are draining, prepare your vegetable bolognese sauce. I use a food processor to first pulse the walnuts and sun dried tomatoes. Then, working in batches, I process all the remaining vegetables and transfer them directly into my nonstick sauce pan. Make sure you do not over process the vegetables. You don’t want to puree them, we’re looking for a chunky, hearty sauce. Cook out the veggies, and then add in your homemade tomato sauce, or store bought. Let your sauce simmer while you start cooking your zucchini noodles (or zoodles). You will be left with a very thick, rich and hearty sauce to top your noodles. Ladle a generous amount of your vegetable bolognese sauce over top each bowl of zucchini noodles. Serve with hot peppers or fresh basil if desired. And just dig in! This dish will satisfy! It was a big hit with my family. In fact my husband asked me when I’ll be making this again! Hope you enjoy this one as much as we did! I’d love to hear what you think in the comments below. 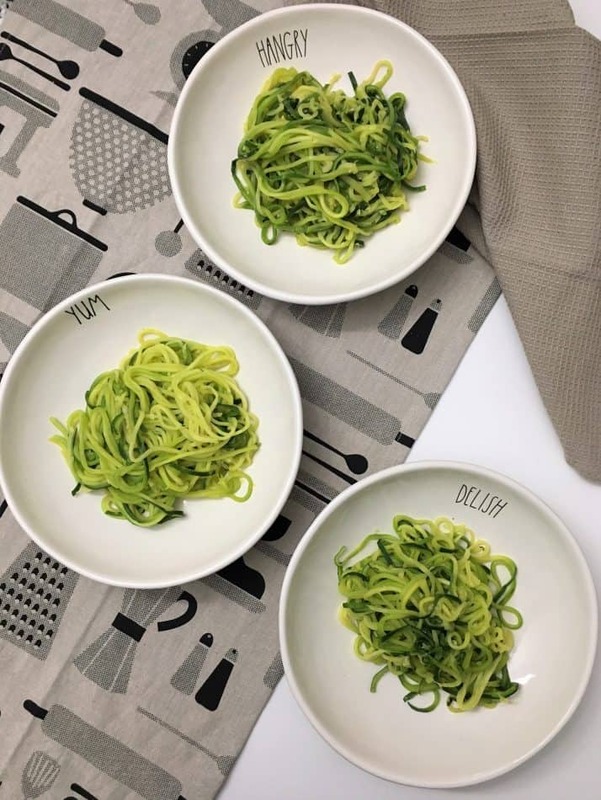 Check out my Pesto Zucchini Noodles (Zoodles) or these ridiculously EASY and satisfying Sweet Potato Noodles. Rich and delicious vegetable bolognese featuring mushrooms, cauliflower and walnuts over top a bed of spiralized zucchini noodles. 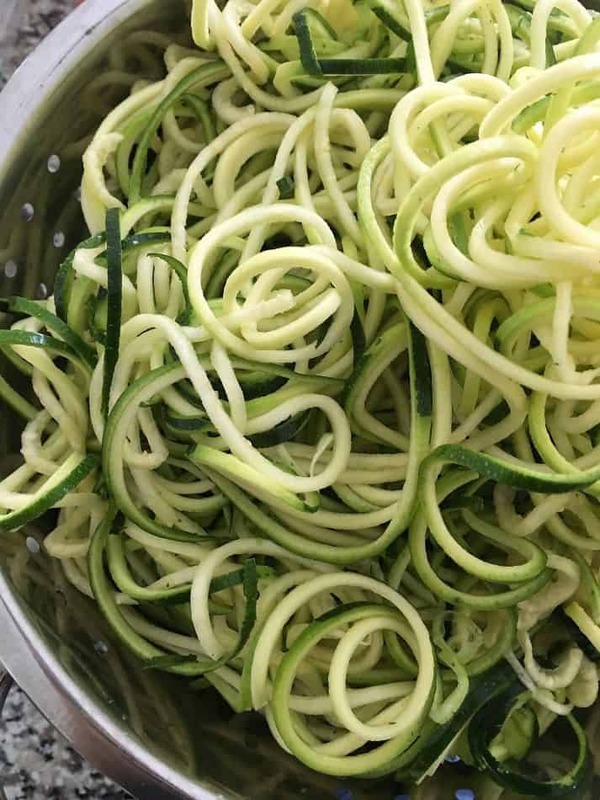 Spiralize your zucchini using your Veggie Bullet or spiralizer of choice. Place them in a colander in a large bowl and generously sprinkle the zucchini with salt. Toss them with your hands and set aside. If working ahead, you may do this step several hours prior to cooking. The longer they sit, the more water will drain. If you're not working ahead, let them sit in the salt for at least 30 minutes. Add the walnuts and the sun dried tomatoes to your food processor and pulse until a crumbly texture is achieved. Do not over process. Set aside. Working in small batches, add the remaining vegetables (onion, pepper, cauliflower, mushrooms) to your food processor and pulse until finely chopped, but not pureed. Transfer the processed vegetables to a large, deep, non stick skillet or sauce pan. Sauté your vegetables over medium/high heat for 5 minutes until softened and reduced. Then add all the seasonings and the walnut and sun dried tomato mixture, cooking for 3-5 more minutes. Then add the tomato sauce and let simmer for 10 minutes while you're cooking your noodles. Serve each bowl of zucchini noodles with a generous scoop of veggie bolognese over top. Garnish with fresh basil or chili flakes if desired.